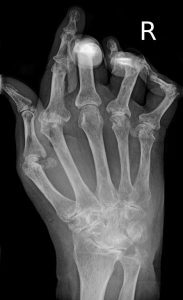 Rheumatoid arthritis (RA) is among the most prevalent of the rheumatic diseases with a lifetime prevalence of 3.6% in women and 1.7% in men . It is a chronic, systemic, inflammatory autoimmune disease of variable clinical course that can severely impact physical functional status and even mortality. Over the past 30 years, as the armamentarium of therapies for RA has exploded, there has been increased debate about the ideal initial therapy. The BeSt (Dutch: Behandel-Strategieën “treatment strategies”) trial was designed to compare, according to the authors, four of “the most frequently used and discussed strategies.” Regimens incorporating traditional disease-modifying antirheumatic drugs (DMARDs), such as methotrexate, and newer therapies, such as TNF-alpha inhibitors, were compared directly. The trial enrolled 508 DMARD-naïve patients with early rheumatoid arthritis. Pertinent exclusion criteria included history of cancer and pre-existing laboratory abnormalities or comorbidities (e.g. elevated creatinine or ALT, alcohol abuse, pregnancy or desire to conceive, etc.) that would preclude the use of various DMARDs. Patients were randomized to one of four treatment groups. Within each regimen, the Disease Activity Score in 44 joints (DAS-44) was assessed q3 months, and, if > 2.4, the medication regimen was uptitrated to the next step within the treatment group. Step-up combination therapy: MTX 15mg/week, uptitrated PRN to 25-30mg/week. If insufficient control, SSZ was added, followed by hydroxychloroquine (HCQ), followed by prednisone. If patients failed to respond to those four drugs, they were switched to MTX + infliximab, then MTX + CSA + prednisone, and finally to leflunomide. Initial combination therapy with tapered high-dose prednisone: MTX 7.5 mg/week + SSZ 2000 mg/day + prednisone 60mg/day (tapered in 7 weeks to 7.5 mg/day). If insufficient control, MTX was uptitrated to 25-30 mg/week. Next, combination would be switched to MTX + CSA + prednisone, then MTX + infliximab, then leflunomide monotherapy, gold with methylprednisolone, and finally azathioprine with prednisone. Initial combination therapy with infliximab: MTX 25-30 mg/week + infliximab 3 mg/kg at weeks 0, 2, 6, and q8 weeks thereafter. There was a protocol for infliximab-dose uptitration starting at 3 months. If insufficient control on MTX and infliximab 10 mg/kg, patients were switched to SSZ, then leflunomide, then MTX + CSA + prednisone, then gold + methylprednisolone, and finally AZA with prednisone. Once clinical response was adequate for at least 6 months, there was a protocol for tapering the drug regimen. The primary endpoints were: 1) functional ability per the Dutch version of the Health Assessment Questionnaire (D-HAQ), collected by a blinded research nurse q3 months and 2) radiographic joint damage per the modified Sharp/Van der Heijde score (SHS). Pertinent secondary outcomes included DAS-44 score and laboratory evidence of treatment toxicity. At randomization, enrolled RA patients had a median duration of symptoms of 23 weeks and median duration since diagnosis of RA of 2 weeks. Mean DAS-44 was 4.4 ± 0.9. 72% of patients had erosive disease. Mean D-HAQ score at 3 months was 1.0 in groups 1 and 2 and 0.6 in groups 3 and 4 (p < 0.001 for groups 1 and 2 vs. groups 3 and 4; paired tests otherwise insignificant). Mean D-HAQ at 1 year was 0.7 in groups 1 and 2 and 0.5 in groups 3 and 4 (p = 0.010 for group 1 vs. group 3, p = 0.003 for group 1 vs. group 4; paired tests otherwise insignificant). At 1 year, patients in group 3 or 4 had less radiographic progression in joint damage per SHS than patients in group 1 or 2. Median increases in SHS were 2.0, 2.5., 1.0, and 0.5 in groups 1-4, respectively (p = 0.003 for group 1 vs. group 3, p < 0.001 for group 1 versus group 4, p = 0.007 for group 2 vs. group 3, p < 0.001 for group 2 vs. group 4). Regarding DAS-44 score: low disease activity (DAS-44 ≤ 2.4) at 1 year was reached in 53%, 64%, 71%, 74% of groups 1-4, respectively (p = 0.004 for group 1 vs. group 3, p = 0.001 for group 1 vs. group 4, p not significant for other comparisons). There were no group differences in prevalence of adverse effects. Fourteen years later, it is a bit difficult to place the specific results of this trial in our current practice. Its trial design is absolutely byzantine and compares the 1-year experience of a variety of complex protocols that theoretically have substantial eventual potential overlap. Furthermore, it is difficult to assess if the relatively small group differences in symptom (D-HAQ) and radiographic (SHS) scales were truly clinically significant even if they were statistically significant. The American College of Rheumatology 2015 Guideline for the Treatment of Rheumatoid Arthritis synthesized the immense body of literature that came before and after the BeSt study and ultimately gave a variety of conditional statements about the “best practice” treatment of symptomatic early RA. (See Table 2 on page 8.) The recommendations emphasized DMARD monotherapy as the initial strategy but in the specific setting of a treat-to-target strategy. They also recommended escalation to combination DMARDs or biologics in patients with moderate or high disease activity despite DMARD monotherapy. 3. “Progress toward the cure of rheumatoid arthritis? The BeSt study.” Arthritis Rheum. 2005 Nov;52(11):3326-32. ANCA-associated vasculitides, such as granulomatosis with polyangiitis (GPA, formerly Wegener’s granulomatosis) and microscopic polyangiitis (MPA) are often rapidly progressive and highly morbid. Mortality in untreated generalized GPA can be as high as 90% at 2 years (PMID 1739240). Since the early 1980s, cyclophosphamide (CYC) with corticosteroids has been the best treatment option for induction of disease remission in GPA and MPA. Unfortunately, the immediate and delayed adverse effect profile of CYC can be burdensome. The role of B lymphocytes in the pathogenesis of these diseases has been increasingly appreciated over the past 20 years, and this association inspired uncontrolled treatment studies with the anti-CD20 agent rituximab that demonstrated promising preliminary results. Thus the RAVE trial was performed to compare rituximab to cyclophosphamide, the standard of care. ANCA-positive patients with “severe” GPA or MPA and a Birmingham Vasculitis Activity Score for Wegener’s Granulomatosis (BVAS/WG) of 3+. 197 patients were randomized, and baseline characteristics were similar among the two groups (e.g. GPA vs. MPA, relapsed disease, etc.). 75% of patients had GPA. 64% of the patients in the rituximab group reached remission, while 53% of the control patients did. This 11 percentage point difference among the treatment groups was consistent with non-inferiority (p < 0.001). However, although more rituximab patients reached the primary endpoint, the difference between the two groups was statistically insignificant, and thus superiority of rituximab could not be established (95% CI -3.2 – 24.3 percentage points difference, p = 0.09). Subgroup analysis was notable only for superiority of rituximab in relapsed patients (67% remission rate vs. 42% in controls, p=0.01). Rates of adverse events and treatment discontinuation were similar among the two groups. Rituximab + steroids is as effective as cyclophosphamide + steroids in inducing remission in severe GPA and MPA. This study initiated a major paradigm shift in the standard of care of ANCA-associated vasculitis. The following year, the FDA approved rituximab + steroids as the first-ever treatment regimen approved for GPA and MPA. It spurred numerous follow up trials, and to this day expert opinion is split over whether CYC or rituximab should be the initial immunosuppressive therapy in GPA/MPA with “organ-threatening or life-threatening disease” (UpToDate).